Radiative recombination of heavy ions. 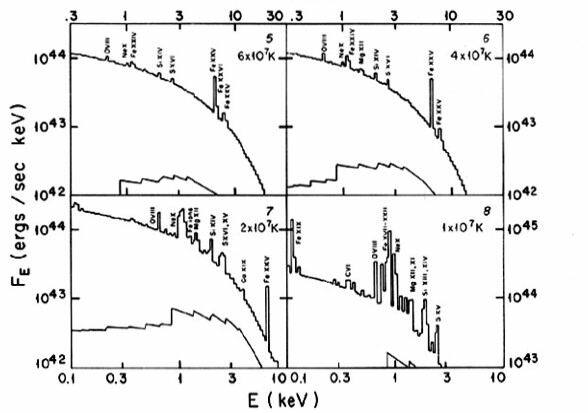 X-ray emission in astrophysical plasmas at temperatures T~106-7 ºK (kT~0.1-1 keV) is mainly due to radiative recombination and line emission processes. In fact these temperatures are too low for Bremsstrahlung to be dominant. These conditions characterize very different astrophysical sources: from stellar coronae to the diffuse gaseous halos of massive galaxies. The image on the left shows an X-ray image of a massive elliptical galaxy whose emission is almost entirely due to the radiative recombination and line emission processes described below. In the lower left corner the smaller companion NGC1404 has a much smaller and compact halo. Several compact sources, mostly background AGNs and accreting bynary stars (see later lectures), are also visible. 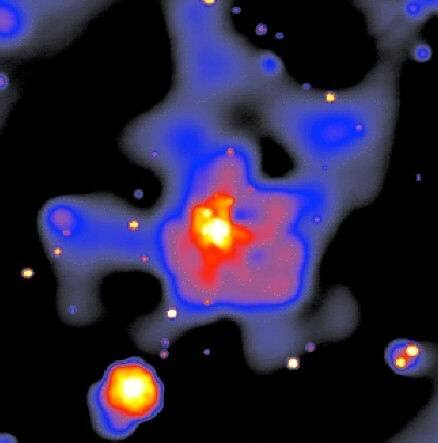 X-ray image of the massive elliptical galaxy NGC 1399 in the Fornax cluster. The emission is represented on a logarithmic color scale which traces the surface brightness. Courtesy of M.Paolillo. This emission process was first observed in the corona of the Sun, and thus it is called “coronal emission”. 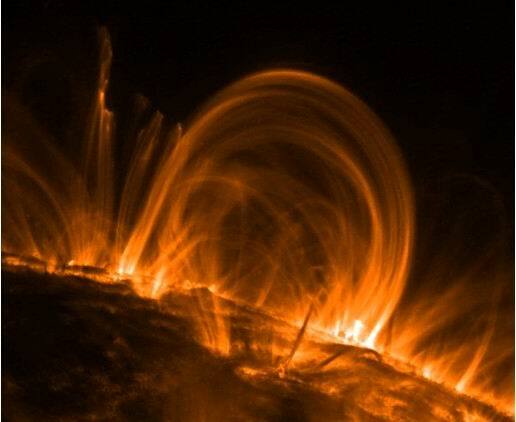 The turbulence in the upper layer of a star creates magnetic loops trapped inside the sun’s plasma, whose energy can heat the corona to temperatures that allow it to emit X-rays through radiative recombination and line emission. This is a solar coronal loop imaged by the TRACE satellite. Courtesy of NASA. the time scale for elastic Coulomb collisions between particles in the plasma is much shorter than the age or cooling time of the plasma, and thus the free particles can be assumed to have a Maxwell-Boltzmann distribution at the temperature Tg This is the kinetic temperature of electrons, and therefore determines the rates of all excitation and ionization processes. 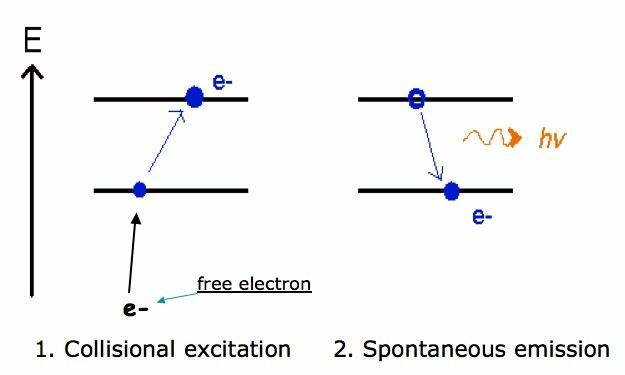 at these low densities collisional excitation and de-excitation processes are much slower than radiative decays, and thus any ionization or excitation process will be assumed to be initiated from the ground state of an ion. Three-body (or more) collisional processes will be ignored because of the low density. 4. the radiation field in a stellar corona, a galaxy or a cluster is sufficiently diluted that stimulated radiative transitions are not important, and the effect of the radiation field on the gas is insignificant. at these low densities, the gas is optically thin and the transport of the radiation field can therefore be ignored. 5. Under these conditions, ionization and emission result primarily from collisions of ions with electrons, and collisions with ions can be ignored. Finally, in galaxies and clusters (but not in stellar coronae) the time scales for ionization and recombination are generally considerably less than the age of the system or any relevant hydrodynamic time scale, and the plasma can therefore be assumed to be in ionization equilibrium. The helium and hydrogen in stellar, galactic and cluster coronae is all ionized, so X-ray line emission comes from transitions in trace element atoms. two-photon decay of metastable levels. Processes that contribute to the X-ray line emission from a diffuse plasma include collisional excitation of valence or inner shell electrons, radiative and dielectronic recombination, inner shell collisional ionization, and radiative cascades following any of these processes. All of the emission processes described above give emissivities that increase proportionally to the ion and electron densities, and otherwise depend only on the temperature. 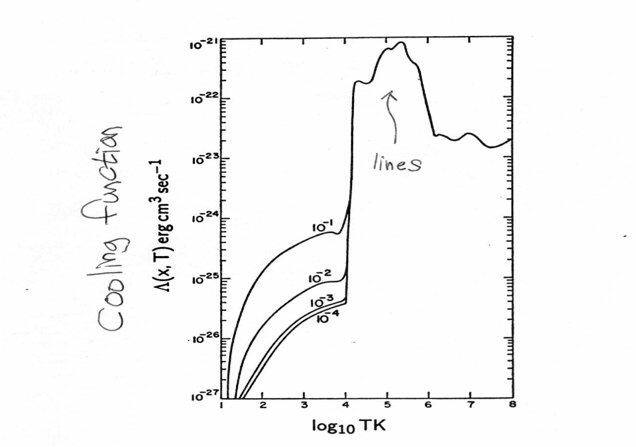 where Ln(Xi,Tg) is the emission per ion at unit electron density and is usually called “cooling function”. The cooling function incorporates all physical processes described in these lectures, and is usually calculated using numerical codes that compute the atomic transition rates for each element and ionization state. This allows to separate the dependence on the temperature, from the one on the density, if we assume to know the ionization fractions and the metallicity of the plasma. Then the shape of the spectrum depends only on the abundances of elements n(X)/n(h) and the distribution of temperatures d(EI) / dTg. The normalization of the spectrum (the overall level or luminosity) is thus set by the EI. 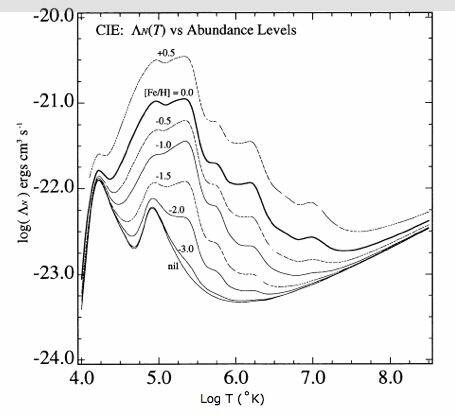 The Cooling Function at low and intermediate X-ray emitting regimes, and its dependence on the metallicity. Dependence of the Cooling function on temperature and metallicity of the plasma. Example of the spectrum produced by the thermal plasma of a galaxy cluster at different temperatures: as the temperature drops the emission lines due to radiative recombination becomes apparent. Craig L. Sarazin, X-ray Emission from Clusters of Galaxies.